Randomness is the concept of unpredictable outcomes for events. Whenever an aspect of a Pikmin game can have multiple outcomes which are not determined by anything controllable, the result is randomly picked. Sometimes this is constrained by a decimal value or an algorithm the game uses, all designed to make no two instances of the game the same. The result of Olimar breaking an egg on a certain frame (top), and on the frame immediately after (bottom). The following is a list of notable elements shared among games that have an outcome up to chance, out of the hands of the player. In the first two games, Pikmin who are knocked down in battle have a chance of losing their bud or flower, and reverting to a leaf. Only the Withering Blowhog's gust and the Segmented Crawbster swiping its arm are certain to revert Pikmin to leaves. If equal numbers of different types of Pikmin are carrying something to the Onions, an Onion is randomly picked. This also applies if only Purple and/or White Pikmin are carrying the object. The amount of nectar contained in a patch of nectar weed and rubble is random, although in Pikmin 2 nectar weed and rubble appear to have an added grace period of low chances after using them up once. Pikmin have a chance of tripping while walking with a group. This chance is much lower in Pikmin 2 than in Pikmin, and tripping is absent in Pikmin 3. There is a small random deviation in the amount of time a Pikmin sprout needs to advance/reset in maturity. For some enemies that drop pellets when defeated, the pellets' types are randomly picked between the available types. Enemies that eat Pikmin have an effected area for eating attacks: Pikmin within this area have a high chance of being captured, until a maximum of captured Pikmin is reached or the attack is over. In all three games, most free-roaming idle enemies appear to choose from a list of distances to travel, times to wait, and angles to turn, within a radius. Usually there is a sequence of move, wait, turn, and repeat, but not all roaming enemies move in only straight lines, especially in Pikmin 3. If an enemy has one or more idling animations (such as the Bearded Amprat stretching or looking around), it will randomly select one or none while it waits. Dwarf Bulborbs wait a random amount of time before noticing a Pikmin that has entered its radius. This does not exceed two seconds. The members of the Arachnorb family choose from a list of times to step before idling. All possibilities are multiples of four. The chance of a Swooping Snitchbug/Bumbling Snitchbug idling in place or performing an idling animation is random. There also appears to be a random time and direction a Swooping Snitchbug/Bumbling Snitchbug will carry a Pikmin or leader before dropping them. In the first two games, there is a chance of a Burrowing Snagret or Pileated Snagret getting stuck while emerging from the ground. The sounds Pikmin make during various events, like being plucked, is randomly chosen from a selection. The leader(s) and Pikmin's idle animations are randomly picked from a list. Most particle effects are emitted in random directions. The sound that plays on the Nintendo logo screen is picked from a list; the chances of hearing one of the Easter egg sounds are quite low. The attacks chosen by the Emperor Bulblax when at less than half health are randomly picked: either extending its tongue or jumping (or a sequence of jumps). There is a chance that a Pikmin sprout will be present in a battle site the day after a battle in which many Pikmin were lost. This chance is constrained by the number of Pikmin lost and the enemy in question. The animation of Pikmin on the Nintendo logo screen is randomly chosen from a set of possiblities, then the actual positioning of Pikmin is random as well. The season picked for the title screen is random, as well as the behavior of the creatures that roam on the floor. The Hocotate ship's vocalizations over dialogues are randomly picked. The generation of most cave sublevels is done by randomly picking the cave units that make up the sublevel. The music uses random elements in its sequencing. The contents of eggs and petrified corpses is randomly chosen the exact moment the contents have to be expelled. Purple Pikmin and White Pikmin randomly choose an Onion as a destination when carrying an enemy or pellet by themselves. They remake this decision whenever Pikmin are added or subtracted, but they hold no say in the destination if Red, Yellow, or Blue Pikmin are carrying. Purple Pikmin have a 30% chance of stunning most enemies; a few enemies have different chances. Objects that spawn from the ceiling, besides boulders, deviate slightly from their target location. The advisory given at the start of a match is randomly picked. Most levels have specific layouts, but the layout that gets picked is randomly chosen. The location Cupid's Grenades spawn at is randomly picked from a list. The item obtained from the roulette wheel in 2-Player Battle is chosen at random. Enemies above ground that spawn in small groups, such as a group of three Dwarf Red Bulborbs in the Wistful Wild, have a random element to their placement. They are all created from one generator that randomly assorts them around a spawn point. Anode Beetles will choose randomly between two or more Anode Beetles with which to exchange electricity. Once chosen, the two cannot be chosen by other Anode Beetles until after their electricity is finished. If a Careening Dirigibug creates a bomb and is then knocked over, it will throw the bomb within a random but bounded distance. Creeping Chrysanthemums wait a random delay before emerging when Pikmin or leaders are nearby. Gatling Groink shots are deviated from their target spot by a random amount. The placement of the boulders that drop in Empress Bulblax and Segmented Crawbster fights is random, but Segmented Crawbster boulders are centered around the active leader. The Man-at-Legs chooses from a list of how long to idle, how many times it can move and idle before attacking, and how many shots to fire. The Titan Dweevil picks the weapon to attack with at random, from the ones it has. In addition, the angle at which electrical nodes are fired from the Shock Therapist is random, and water bubbles from the Monster Pump randomly deviate from their target by a small amount. The types of Unmarked Spectralids that spawn underground are picked from a list; yellow Spectralids have the largest chance of spawning. They also randomly choose whether and how long to rest on Mamutas. Mitites have randomly deviated times to emerge and to burrow. The chance of an Ujadani attacking with poison is random, but considerably low. The Pikmin walking across the bridge in the background of the title screen is random. There is also a random chance of Winged Pikmin flying across the title screen at certain intervals. The color swirls of the Master Onion are random, although it will only display currently-owned Pikmin types. Leader dialog outside of cutscenes is randomly chosen from a list of presets. When all three leaders are walking together with no Pikmin, there is a random delay before they will start singing their own theme (heard during the game's opening cutscene). 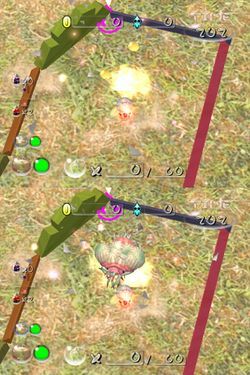 A great deal of Pikmin and enemy sound effects deviate slightly in pitch each time they are played. Water undergoes tiny random fluctuations to keep it from becoming completely still. This effect is augmented during rain. The explosion radius of bomb rocks is slightly different for each explosion. The contents of certain dirt mounds are random after they have been dug out at least once. The arrangement of Pellet Posies on the Quaggled Mireclops' body after it has been defeated is random, but there will always be at least two 5 pellets and two Red Spectralids. Before a day or a Mission Mode stage begins, a tip randomly but sequentially selected from a list of tips is displayed in the bottom left corner of the loading screen. Each stage has three different layouts of enemies and objects from which to choose randomly. Bingo cards are randomly assorted every game, and the Shuffle powerup re-assorts them randomly. Cupid's Grenades and Golden Grenades spawn at random times in zones selected from a list, with a little deviation each time. The roulette picks a random power each spin. The Warp powerup seems to be mostly random in where it sends the opponent, as long as the destination has terrain and other objects are clear of it. Boulders fall randomly in a radius around the current opposing leader. The Burrowing Snagret can choose between its normal peck to capture Pikmin and ramming its beak into the ground to capture a leader. Grub-dogs in Pikmin 3 have a chance of burping after eating Pikmin, delaying their next move slightly. The Plasm Wraith's Elemental Plasm attack will spawn a random element each time it is used. The Sandbelching Meerslug, after taking at least half damage, can choose between shooting multiple small sand boulders or one very large sand boulder. The Shaggy Long Legs has a very distinct movement pattern that is determined by random outcomes. Once it has landed, it will randomly choose one of its feet to begin stomping; this foot becomes its "primary foot", and it will cycle stomping its feet counter-clockwise from its primary foot. It can only shake off Pikmin once it has stepped down on its primary foot once again. If it stops to shake off Pikmin or completes a cycle of steps, it will either continue its current path or it will change its primary foot and start a new path. Once it has been attacked at least once, it will flee to a different area of the level. The amount of nectar a single Swarming Sheargrub can drink at once is random. Yellow Wollywogs will spend a limitedly random time suspended in the air before falling. This page was last edited on February 25, 2019, at 02:24.